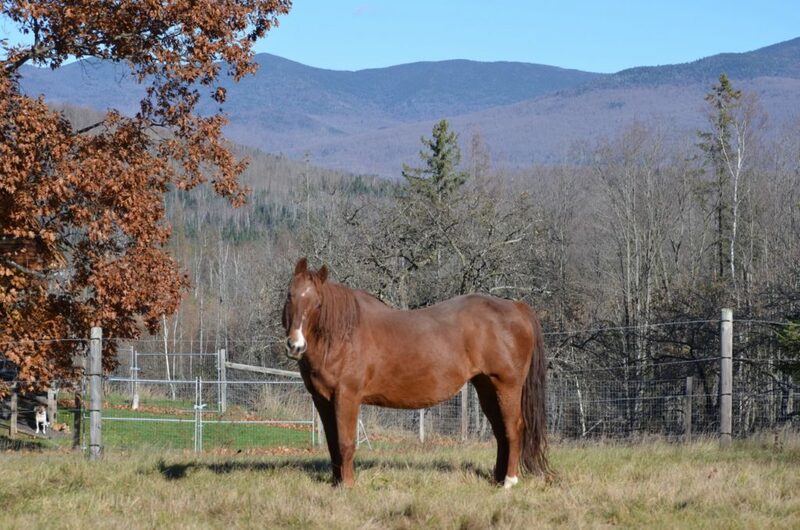 I took these photos of our blind Quarter Horse mare Lena yesterday afternoon as she was enjoying another sunny and warm autumn day, just relaxing and soaking in the sun. (This being northern New Hampshire, “warm” for mid-November?means?a balmy 50-something degrees.) She had been laying on her side, flat out, head down on the grass, snoozing, but no matter how quietly I tip-toed up through the pasture to get a photo of her sleeping like that, I could see her ears quivering and knew she was hearing me. Just as I had the camera ready, she sat up to check things out. If you look closely under the oak tree (the last deciduous tree around here with any leaves left! ), you can see Tanner, Taco and Sunny at the end of the ramp in the front yard. There’s that classic “blind horse head tilt” — using her hearing to get a better fix on my location. I went over to her, gave her a good neck scratching, then headed for the house. She went back to her leisurely Sunday afternoon. Today is another beautiful day just like yesterday, and she’s out’there enjoying herself again. With winter fast approaching, we just can’t get enough of this kind of weather! She’s so beautiful! I’m glad she’s enjoying the weather. Great pictures. Great photos. Love the head tilt – my blind cat Hope does the tilt too. It has been gorgeous on the West Coast too. My hanging baskets on the deck are still blooming! But we are due for a drop in temp this week. 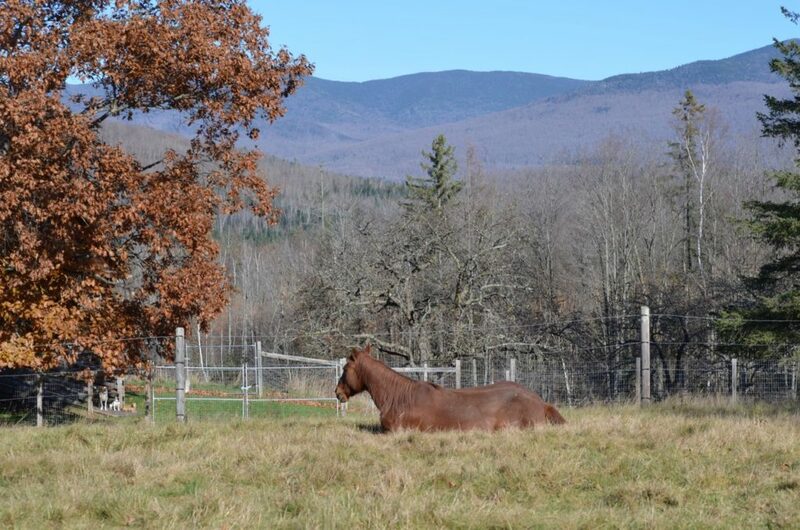 Nothing is more calming than to see a horse at rest, laid out, totally relaxed. She knows she’s safe at the Rolling Dog Farm. Lena is such a gorgeous old girl! Nothing more peaceful than watching your horses so relaxed like that. I used to just go sit out in the pasture beside him, when my guy was catching up on his REM sleep haha. I guess a blind horse is infinitely more cautious when it comes to being flat out, but catching them asleep always brings on a smile! Lena looks very purposeful. She’s not going to let her favorite person sneak up and then get away without saying hello. Looks like a beautiful end-of-fall day. Let’s hope the snow holds off for a bit longer. Glad to see Lena is enjoying fall! It is so wonderful to see Lena! 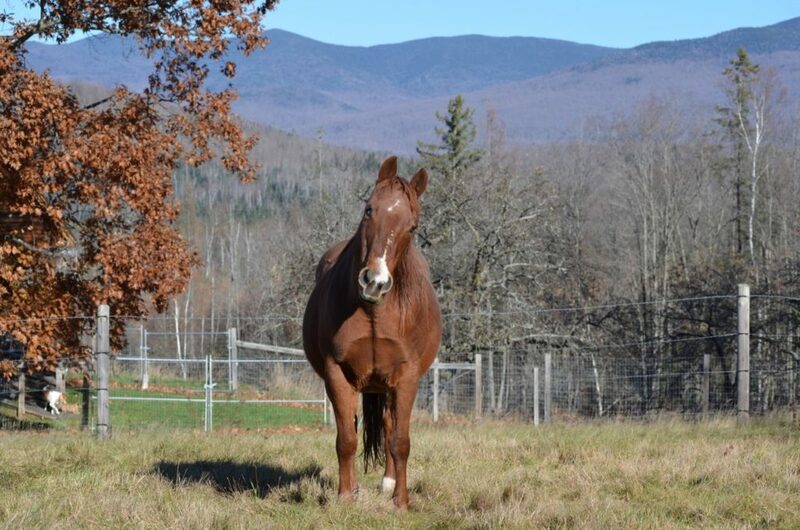 She looks healthy, beautiful, safe and happy at her home on the ranch. Enjoy the Fall sun…..everyone. We visited Lena (and Cash when he was a very young colt) years ago at Rolling Dog in MT. I have a treasured photo of my husband Jerry talking with Lena in the pasture. She was a young girl then. It is so wonderful to see her well and still being doted on at Rolling Dog. I love these photos of her. Thank you for all the care you and Alayne have given to her all these years.